Discover how to make the most of your stock investments in our free special report, Stock Market Investing Strategy: Pat McKeough's Conservative Investing Guide for Making Money & Cutting Risk. 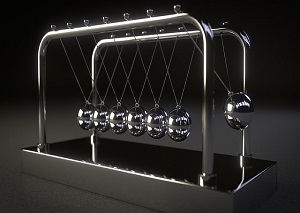 The pendulum theory grew out of Sir Isaac Newton’s 17th-century studies of gravity and physics, particularly his second law of motion. Yet the theory turns up in discussions of all sorts of non-mechanical topics. This includes investors’ efforts at understanding the stock market. What do “buy low, sell high” and Sir Isaac Newton have in common? Marketing timing strategies like “buy low, sell high” make sense of past market movements, but are pretty much useless at predicting the future.